Adorable, right? I beg to differ. I don’t mean to offend anyone who’s chosen to adorn his or her car with these semi-permanent illustrations. Can someone just explain the appeal to me, please? Pretty awesome. I have to admit, I feel the same way. In other car-related news, Kevin and I purchased a new one yesterday! (It was to replace his Nissan Altima, whose alternator caught on fire — thus totaling the car — the week before Christmas. Really cool.) Though we hadn’t exactly planned to buy a new car right now (what with Kevin being in grad school and all), we’re pretty pumped about our new Mazda CX-5. Since I have a 2006 Mazda 3, we’re now a two-Mazda family! Fun stuff. And one thing I can tell you for sure? 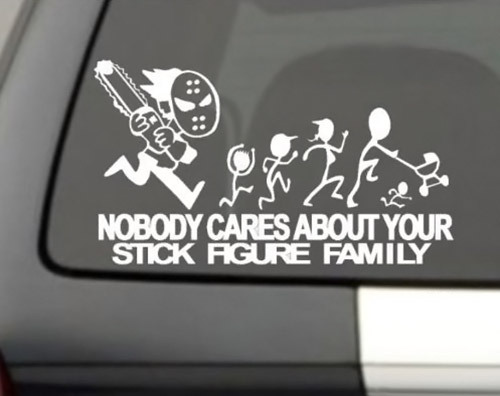 Neither car will ever have a stick figure family on its back window. 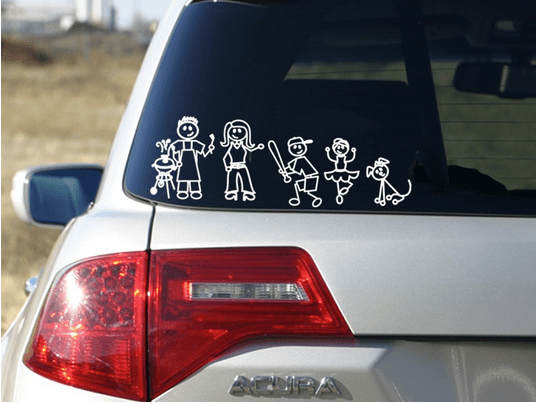 My take on the stick figure family is that personal family information has no business on the back of a vehicle. Lord only knows who is looking at it and stalking it. I have a the same opinion about children wearing clothes w/ their names printed on it at places like Disney, 6-Flags, etc….but thay may just be me. Mazdas are great! We bought a Mazda 3 a few months back and are loving it. Patrick — Ha! 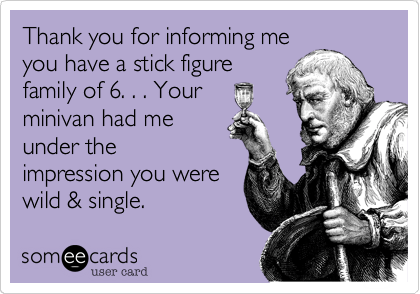 I love that stick figure family joke. I hadn’t seen that one before. Hope you’re doing well!